From the suicide of her mother to the last empty days of her marriage, Mori finds a way to begin again on her own terms. 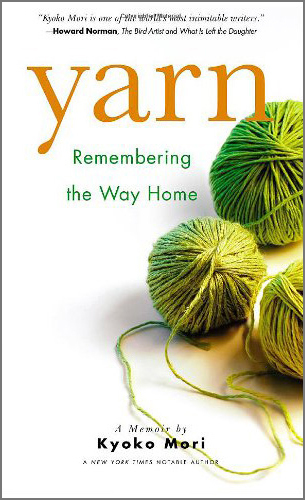 Interspersed with fact and history about knitting throughout, the narrative touchingly contemplates the nature of love, loss, and what holds a marriage together. In the tradition of M.F.K. Fisher’s The Gastronomical Me and Michael Pollan’s The Botany of Desire, Kyoko Mori examines a particular subject to understand human nature—when to unravel, when to begin again, when to drop the stitch, and when to declare. . . it’s finished. While it is knitting that literally and metaphorically weaves together the disparate elements of Mori’s life—her travels, her marriage and separation, her coming to knowledge of herself through tragedy and joy—it is the sheer beauty of her writing, at once elegantly restrained and emotionally unflinching, that so highly recommends this stunning memoir. Kyoko Mori is one of the world’s most inimitable writers. Kyoko Mori’s books are like red dragonflies at sunset. Afterwards, I’m not sure if I really experienced them or if it was a dream. Writing as a woman caught between cultures, Mori is a marvelous hybrid of Western realism and Eastern sublimity. In Yarn, Kyoko Mori employs the metaphor of knitting to devastating effect: strands are wound together seamlessly into a single garment, which is used to keep the wearer/reader/author warm. and How Literature Saved My Life.